ParQube LX is a flexible unit that fully controls exit lane by scanning a barcoded ticket to all transient users, by checking card, TAG, etc. to all permanent users. Full color graphic display option, gives clear user messages. The Entry/Exit stations for the ParQube product range feature the latest and most advanced technologies. Thanks to the modularity of the design combined with the flexibility of the management software solutions the stations are ready to accommodate any number of future developments. 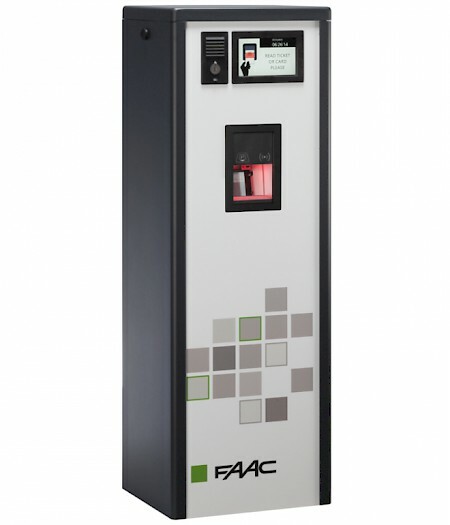 The Parking barriers, managed by the Entry/Exit stations, come from the FAAC Group’s many years of experience in gate automation. Our ticket technology is based on a very reliable barcode solution that allows reading of even the most worn tickets. With dual 2D barcodes printed on the ticket this allows us to read the information frompartially damaged or even missing sections of code. In this way we can combine an effective and valuable solution that is also economic with very low levels of maintenance requirements. Payment for the ticket is carried out at either the automated payment station or fee computer by electronically validating the entry ticket. This makes it possible to keep operating costs low by not reprinting the ticket. The front panel display provides clear guidance information to users. Communication between the management system and the Entry/Exit stations uses highly reliable networks - RS485 or TCP/IP. ParQube Entry/Exit stations offer a very high level of flexibility such that they can be configured for almost any customer requirement. The same Entry/Exit stations can thus manage several technologies to identify the parking customer such as short range contactless Radio-Frequency Identification (RFID), long range Automatic Vehicle Identification (AVI), and License Plate Recognition (LPR) as well as barcode tickets by simply adding ancillary devices. All ParQube parking systems are equipped with FAAC automatic barriers which are internationally known for their high level of reliability. FAAC automatic barriers are also used at the toll gates on the Italian motorway network as well as in a number of other locations on motorways worldwide. ParQube - one solution for all your needs.